According to author, yoga practitioner, and yoga teacher Norman Blair, Brightening Our Inner Skies: Yin and Yoga has been a book in the making for more than ten years. In his introduction, he shares briefly the lightening--the brightening--that his practice of Yin yoga has brought him. By offering elements of his own personal story, Blair describes both the history and the benefits of Yin yoga, eventually going on to detail specifics of a Yin yoga practice. Blair structures the main body of the book around what he believes to be nine of the most important Yin yoga postures. Yet the accompanying narrative is more philosophical than instructional. 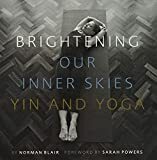 Throughout the book, Blair repeatedly returns to the theme of "brightening our inner skies"--the ways in which Yin yoga can help to soften the edges, and ultimately (as suggested by the Yoga Sutras of Patanjali) "to still the fluctuations of the mind." Blair writes with humility, noting that after many years of practice, he has yet to achieve enlightenment. He also writes with a sense of reverence and devotion, sharing his infectious enthusiasm for the positive impact that yoga has had on his life. Blair inspires with prose that is rich in its sincerity, authenticity, and relatability. Although he protests early on that Inner Skies is not an academic work, his yoga expertise--and with Yin in particular--is clear through the many references almost seamlessly woven into the narrative. The text also includes more literary passages, from short quotes by Buddha to longer poems and metaphors, such as the relatively well-known story of the Indian and the two wolves. The final fourth of this book features Appendixes focusing solely on the Yin postures, providing an excellent practice manual. Blair incorporates the nine poses from the first section of the book as well as twenty-eight others, plus savasana (final relaxation). In Appendix A, each posture is featured on its own page, and the accompanying instructions describe how to get into the pose, how to modify the pose, alternatives and variations, and the anatomy/meridians addressed by the pose. Most posture descriptions are illustrated with three photos, but all (with the exception of the nine different versions of savasana) have at least two, and some have four photos. As a yoga practitioner for over fifteen years myself and now a yoga teacher, I have read many different yoga pose guides, both in print and online, and I found the information Blair provided to be amongst the best I have ever encountered, particularly in terms of modifications and use of props. Appendix B offers specific Yin yoga sequences, including shorter, longer, and several centered around meridians. A final Appendix, C, provides additional information on the meridians. As much as this book is beautifully written, it is attractively formatted as well. An oversized, square paperback, it has the appearance of a coffee table book, with luxurious, thick pages and many photographs sprinkled throughout. Brightening Our Inner Skies: Yin and Yoga was simply a joy to read on many levels. It is likely to appeal to most yoga practitioners, but for those interested in Yin yoga, I'd highly recommend this book as a must-have addition.